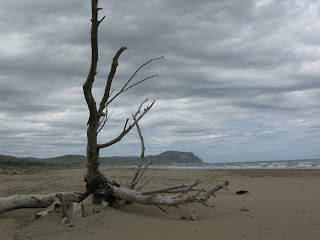 This beach is near Porangahau, which we were told means "mighty wind" in Maori. If that is true, it is a very well-named place. Lovely - thanks for sharing this! My absolute best job while living in NZ was two days worth of driving the Hawkes Bay coast, stopping at every tiny beach settlement - from Mahia to Porangahau! It was for a coastal hazard assessment project. My boss & I were 'ground truthing' aerial photos. So - we were driving from beach to beach and wandering around doing visual checks of erosion. The weather was beautiful... Ah, I did love my job in NZ. How could I argue with getting paid to go to the beach!